Want tosave 0,45 kn on this order and become Loyalty program member? 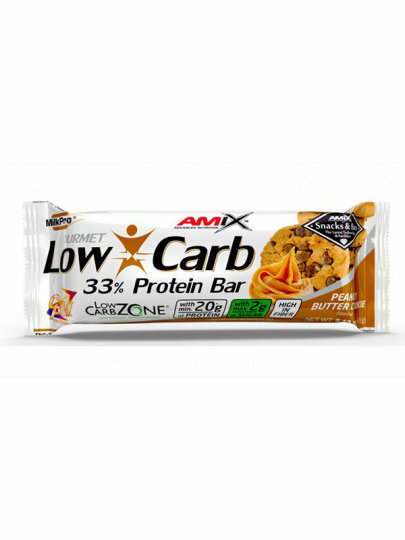 Amix ™ Low Carb 33% Protein Bar is a delicious low carb chocolate, especially low in sugar content and high protein content. Ideal as a snack or before / after physical activity / training. Amix Milk Pro protein blend 36.7% (BarPro ® milk protein isolate and CFM ® whey concentrate, protein isolate and milk / concentrate concentrate); maltitol syrup, filling: polydextrose; vegetable fat (palm oil, palm oil and shea oil in different ratios); peanut butter 11.3% (pure roasted, blanched and smoothly ground Argentine peanuts); thickener: glycerol; emulsifier: soy lecithin, aroma, sodium chloride. It can contain traces of eggs, gluten, seafood, nuts and peanuts. Consume one chocolate each day. Excessive consumption can cause laxative effect.